I’m delighted to finally flip my calendar to September! Even though it typically gets hotter over Labor Day weekend before the mountains give it up to the autumn chill (and this year was no exception), I welcome September with open arms. 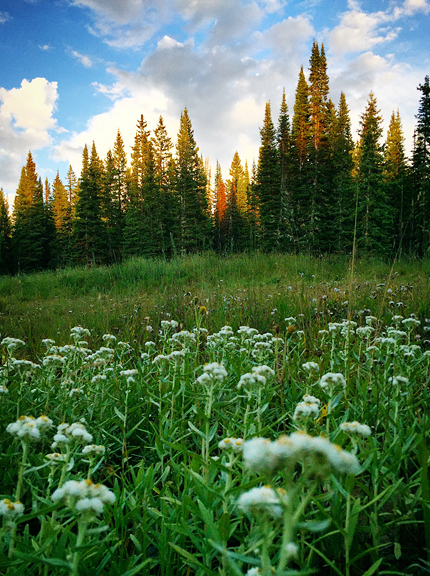 Here in the high country, we run late getting around to spring and summer, but are rather punctual when it comes to autumn, and even early on winter – thank goodness! That’s definitely why I feel my summers are crammed full of activities, because true summer is short in the mountains and it’s when everything seems to happen. A few weeks ago I took a mountain biking class in Boulder, because I wanted to reduce my chances of crashing into things. Something the instructors said over and over was, “…with intention – as in life, as with everything.” They wanted our actions on the bike to be intentional – to ride the bike instead of letting the bike take us for a ride. But I really liked the non-bike part of that, too: WITH INTENTION. It really does apply to everything. Take mushrooms for example. I’m not the type of person who feels a compulsion to put every single mushroom I find in my mouth. You may laugh, but so many new people on mycological forums seem hellbent on not doing their homework and getting themselves into the hospital or even the grave. I’m selective about the mushrooms I forage and I’m careful about the ones I drop in my bag. Jeremy and I have established a rule that unless you are 100% certain of the mushroom you are inspecting, it does not go into the bag (and potentially into someone’s gut). Just about every variety I forage has an imposter that could make you sick or kill you. I first learned to hunt porcini with an incredibly knowledgeable and careful forager. From there, I have happily stumbled across chanterelles and morels and oyster mushrooms on my many hours spent hiking the mountain forests. But for the first time ever, I set out to find a mushroom I had never seen before, did my homework, went straight to a place that seemed like the ideal environment, and found that mushroom. We found a lot of them. Right place. Right time. Right on. With intention. 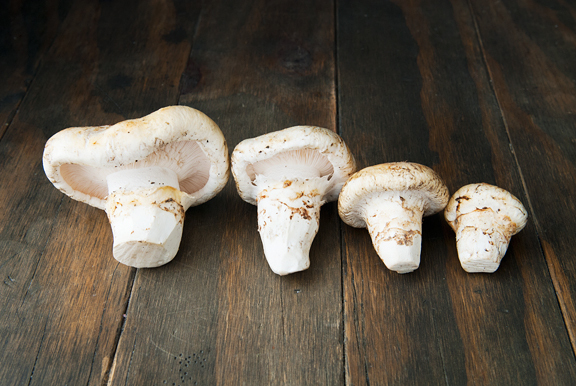 The name matsutake means pine mushroom (matsu = pine, take = mushroom) and yeah, the name is Japanese. This underground wonder smells strongly of spicy cinnamon (red hots candies, to be specific), with a helping of pine resin and funk, and is highly coveted in Japan. Theirs is a brown matsutake which grows in Asia. Ours is a white matsutake, also called American matsutake. They are delicious cousins. 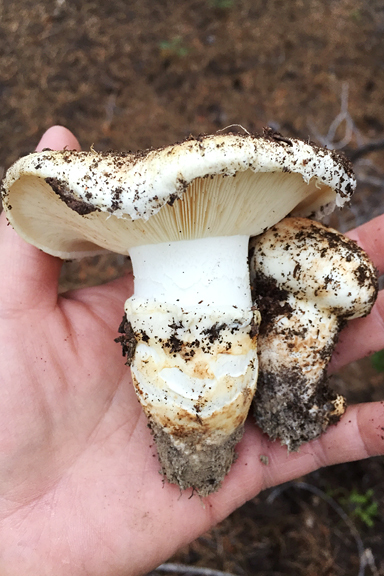 Matsutake differ from all of the other mushrooms I forage because they grow underground, only popping above the forest floor when they are relatively mature. 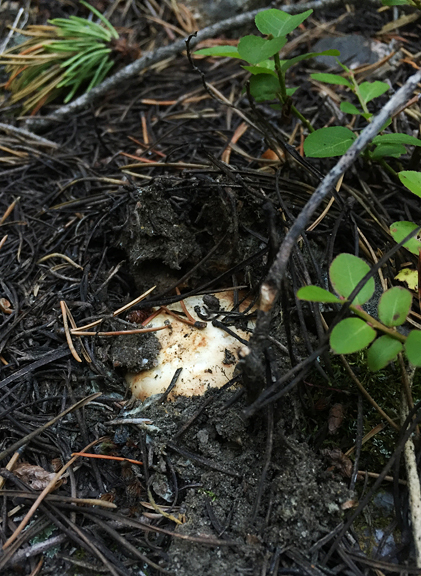 But looking for subtle mounds in the forest duff (we call them shrumps = shroom + humps) can reveal matsutake or a whole host of other mushroom species, some toxic. You have to look at the identifying characteristics and give it a good whiff. 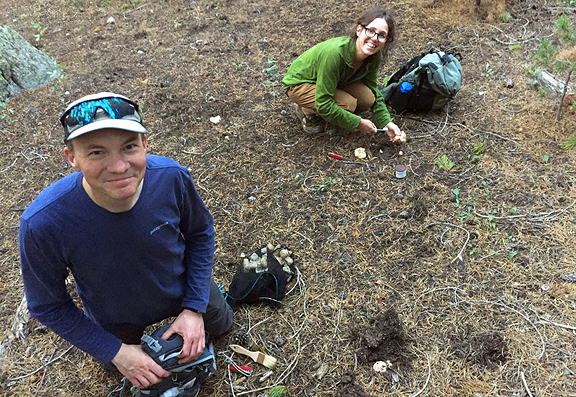 Erin and I pulled an itty bitty mushroom that looked just like a matsutake, but had no odor. NOT a matsutake and hence, does not go into the bag. Rules. There’s a lot that happens in my brain the moment I find a new edible mushroom. There is pure joy over the “proof of existence” and that huge adrenaline rush at having found it. Then I start to wonder if there are more or if this was a sort of fluke single occurrence. You always want to find more, not simply because cooking a lonely single mushroom is a bit of a sad thing, but to see the different stages and forms that this specific mushroom takes as well as the varying environments it can inhabit. If there are a lot of them, you learn which ones are more desirable (clean and worm-free are desirable to me) and which ones to leave alone to do their mushroom jobs. And then there is the question of how to cook the mushrooms. Most of the others are no-brainers: mushroom meet butter and skillet. But the matsutake is not like most other mushrooms. The last thing you want to do is mask the delicate cinnamony-piney flavor. So I went with the other no-brainer for mushrooms: tempura. Japanese cooking technique with a Japanese mushroom? Sounds about right. Most of the matsutake I have pulled were flawless. Not a single worm. But I did find a few whose stipes and caps were completely riddled with worm tunnels having a lovely feast of their own. I think a quarter inch thickness on the slices is thick enough to deliver a meaty bite while allowing you to examine the mushroom for worm holes and their engineers. 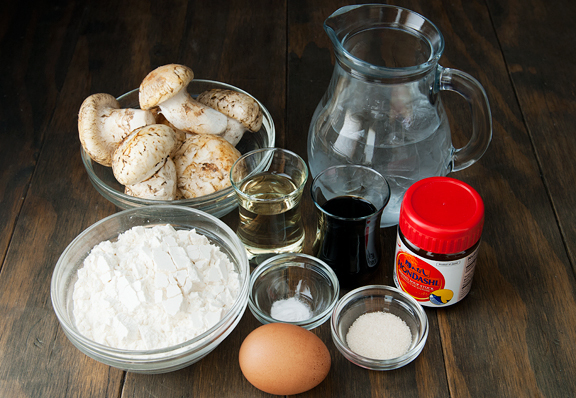 When you are about ready to fry your matsutake (or any mushroom), make the dipping sauce and keep it warm until you serve it. 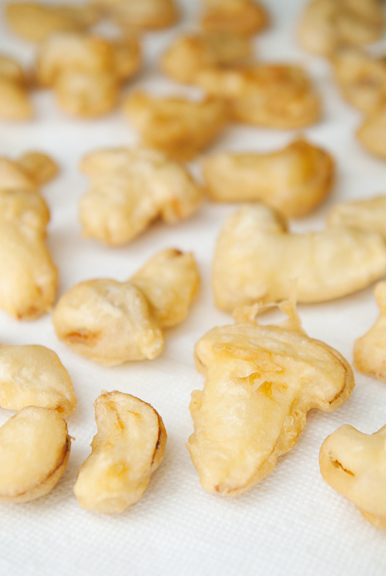 The frying goes quickly as you dip each slice into the batter and fry it until golden. I gave my slices about 2 minutes each side for a total of 4 minutes. Work in batches or else the temperature of the oil will drop dramatically and you won’t get the right kind of fry on your batter. Plus, the slices will stick together in a overcrowded pot, so try to avoid that. Tempura frying is a simple preparation that works well with just about any mushroom, but especially matsutake. These mushrooms are meaty like a fresh porcini, but a little crunchier in texture. Matsutake pair nicely with seafood, so the dipping sauce – which is mostly dashi – rounds out the mushroom’s own forest flavors beautifully. 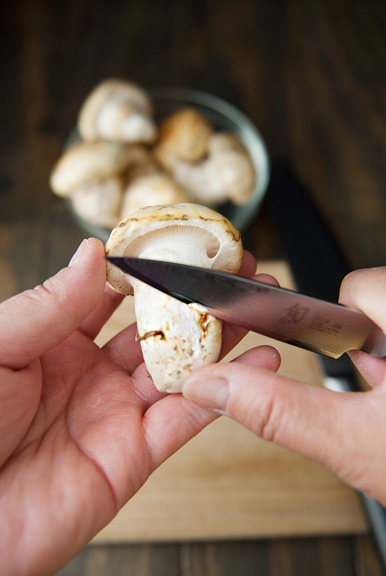 If you don’t forage matsutake yourself, you can try to find some at good Japanese grocers. 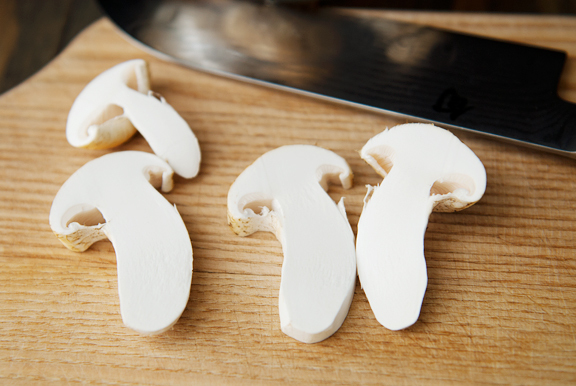 However you decide to enjoy matsutake, do enjoy them. Just close your eyes and imagine walking through the forest. 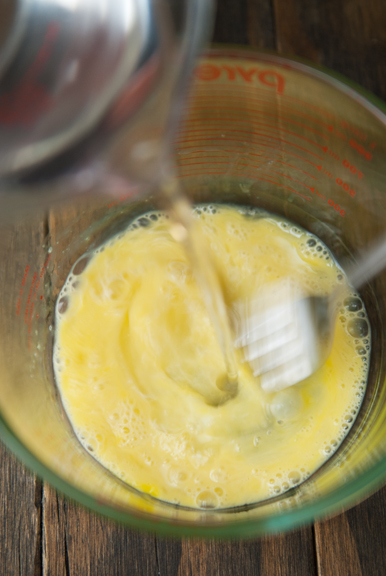 Make the tempura batter: Combine the ice water and egg in a vessel. 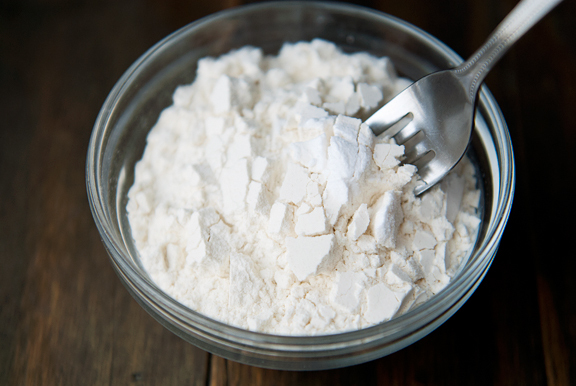 In a bowl, whisk the flour and baking soda together. 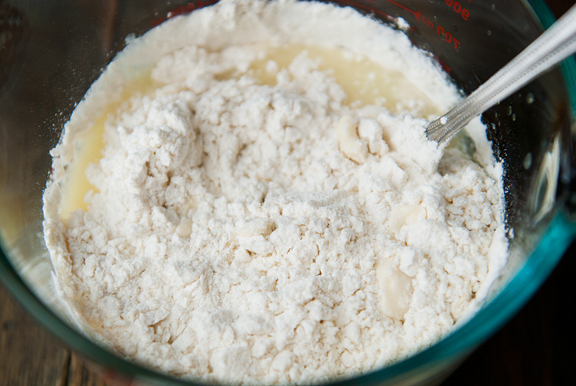 Stir the dry ingredients into the wet ingredients (lumps are okay). Store in the refrigerator until ready to use. 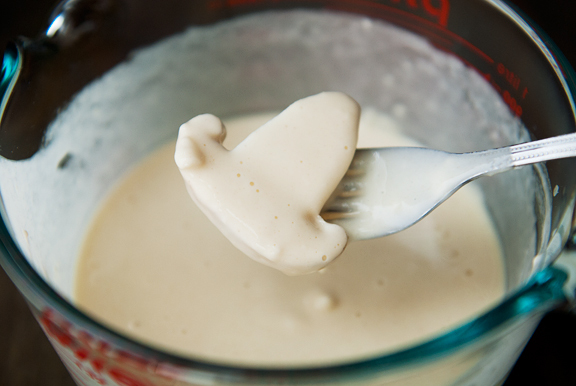 Makes just under 2 cups of batter. 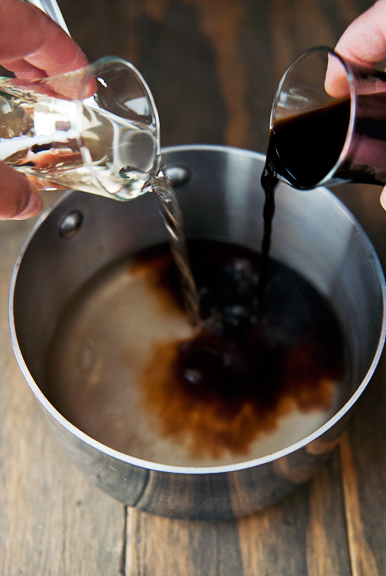 Make the tempura dipping sauce: Place all of the ingredients in a small saucepan and bring to a boil over high heat. Remove from heat and set aside. 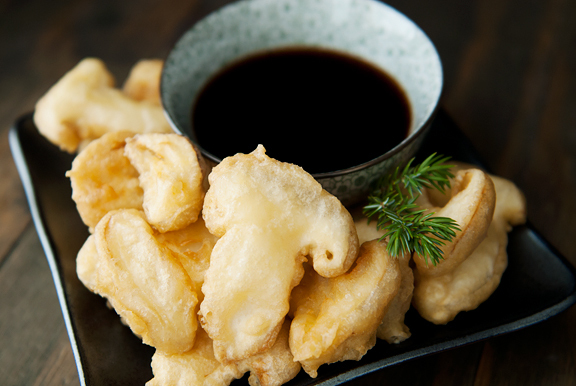 Make the tempura: Heat 2 inches of vegetable oil in a large pot until the oil reaches 350°F. 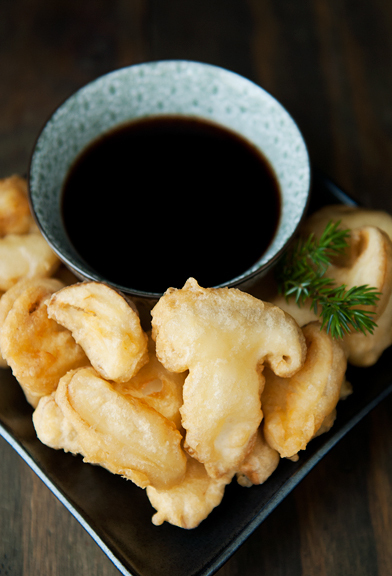 Dip mushroom slices into the tempura batter one at a time, completely coating each slice. Gently lower the slice into the hot oil taking care not to overcrowd (work in batches). Fry until the batter is golden (a couple of minutes), then flip the pieces over until the other side is golden. 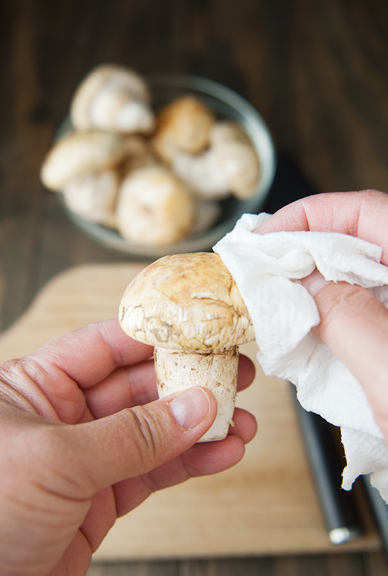 Remove from oil and let drain on paper towels or a cooling rack. Serve hot with the tempura dipping sauce. One of my friends goes foraging for mushrooms but I don’t have the knowledge or courage. 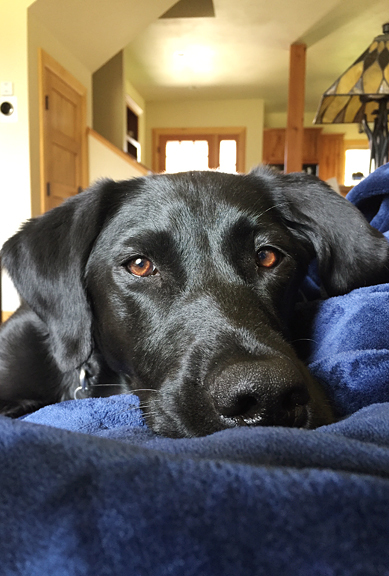 I enjoy reading about your foraging and discoveries. Thanks for the great post. I am also going through your recipes to figure out those I wouldn’t have allergies to and am quite thrilled that I’ll end up trying several of the recipes and have a change in my diet and more variety. thanks so much! The mushrooms are beautiful! I would love to forge, but don’t live in an area that I could do it. Yum…tempura! I admire your dedication to foraging! I will forage mushrooms in my next life. Thanks for the inspiration. Ok. I’m getting a book and taking a class next year. This is just too cool. Thank you for sharing your knowledge (and warnings!). 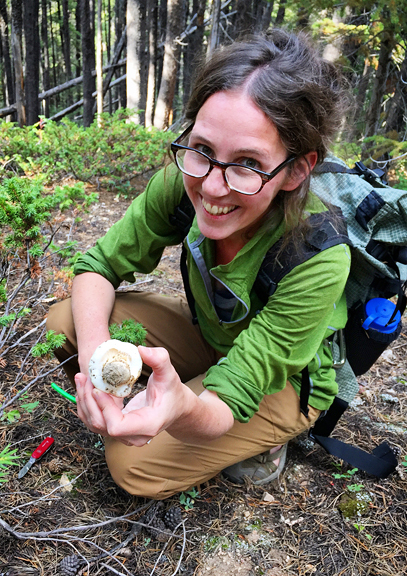 Ellie’s friend – If you are interested in getting into foraging, I highly recommend finding a local mycological society (they exist everywhere, but aren’t especially high profile in most places) and go on a few guided forays with them. Experts will teach you a lot about the mushrooms and plants and area in which you live. Then if you still like it, pick up some good books on mushrooms (for both general and local) and start studying the ones you want to find. It’s easiest to go with one or two species first and then broaden your search after you have experience. Good luck! Matsutake Gohan (mushroom rice) is quite good too!